Providing a convenient space for workers to take a break, use the restroom, store valuables and uniforms, clean up, and change clothes is a necessity on remote job sites. So Falcon’s design and engineering team developed a turnkey, 40ft Locker Room and Comfort Station container to address these needs. The oil and gas industry, among others, often use locker rooms at remote locations, spanning several miles, with workers shifting locations every few days or weeks. Access to a comfort station nearby helps keep employees content and enhances productivity. In addition, many workers are exposed to contaminants on job sites. So our solution needed to double as a decontamination station, where employees could remove personal protective equipment, shower, and changes clothes. The inspiration for our new, standard, 40ft Locker Room container presented itself in 2015. A client in the offshore oil construction industry asked for a mobile restroom they could easily move around a job site. Boosting employee productivity and morale were other key goals. Since ISO shipping containers are inherently mobile and durable, Falcon’s mobile restroom provided the ideal solution for the client’s application. The mobile restrooms are easily repositioned when employees change locations, which reduces downtime needed for bathroom breaks. It also eliminates the need to construct completely new facilities at each location. A plus for both employee and employer. Additionally, employees appreciate the clean, climate controlled environment – something you won’t find in a traditional porta-potty. Learn more about Falcon’s Mobile Conex Restrooms in this past post. Following up with a turnkey locker room and comfort station container was a logical next step. Climate control systems and insulation that can handle extreme weather conditions. Easy-to-clean restrooms with toilets, sinks, and showers (including plug-and-play plumbing). Turnkey lighting and electrical components. Convenient, sturdy personnel doors and privacy windows. Oil and gas (natural gas plants, oil field job sites). Landscaping, golf courses, and more. The standard 40ft Locker Room comes equipped with private showers and restrooms located on opposite ends of the shipping container. The central locker room space can be fitted with lockers, benches, charging stations, and other options. You can review our standard shipping container options here. Turnkey electrical. 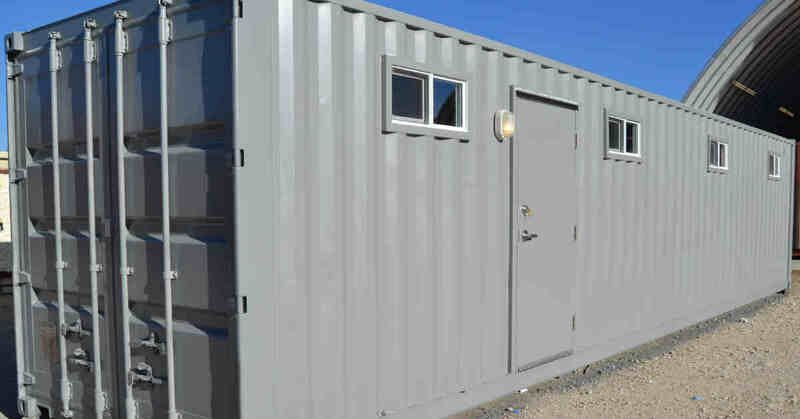 With Falcon’s modified shipping containers, we pre-install the electrical components, so you can quickly connect to electricity once your container arrives. Turnkey plumbing. Our shipping container structures allow you to tap into a water supply onsite, so plumbing setup and maintenance are a breeze. No need to mess with costly water tanks, which need constant servicing. No special foundation required. The only requirement is a stable, level piece of ground. In most cases, you won’t need steps, ramps, tie downs, or skirting either. Little ongoing maintenance. Because shipping containers are inherently durable, they require very little up-keep, keeping maintenance costs low. Lean more about shipping container maintenance in our recent post. 877-704-0177 to speak with a friendly representative. Already know what you’re looking for? Get a quote today.